Our feature film East Side Sushi showed at the Lucas films in the Presidio to the cast and crew the night before the world premiere at Cinequest Film Festival. East Side Sushi Trailer 2014 and NEWS!!!!!! This is a feature film that I art directed. 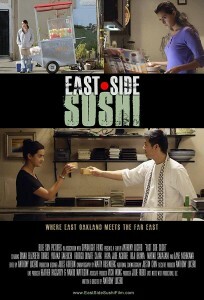 I am honored to say that the world premiere of East Side Sushi will be at the Cinequest Film Festival on March 8th and will be competing in their Maverick Feature Narrative Competition. Wish us luck!